Landing a titanic flow of coins is the goal in Volcano Eruption Extreme, the latest video slot release from NextGen Gaming that has just gone live. This prehistoric-themed adventure is a 5 reel, 25 payline video slot that combines some classy comic book-style design with some potentially explosive features. The best winning chances arise in the game’s only bonus extra which is triggered by landing 3 wilds on the middle 3 reels on the same spin. After a payout of 5 times your bet, you’ll then go on to play the Eruption feature. On offer here are 5 re-spins. Boosting your winning chances is the stacked wild that fills the whole of the middle reel for the duration of the feature. The volcano can spew out even more wilds onto reels 2 and 4 during the re-spins too which can create some potentially explosive combinations. The design here is pretty good. With plants, mountains and a mighty volcano in the background, you’ll see rocky A to 9 royal values alongside a selection of wild animal symbols. The best payer is the dinosaur which will get you an award of 20 times your bet if you land 5 on a payline. The sweeping orchestral backing track gives the game an epic feel that matches the volcanic theme. It all comes together rather nicely. You might expect a video slot with this volcanic theme to be an extremely explosive one on the volatility front. That’s not really the case. In fact, the variance is in the medium range offering a balanced range. It does offer wins of 3,289 times your bet in the Eruption feature though! The base game action rumbles along in a rather steady fashion. The number of re-spins on offer in the bonus round isn’t especially large but all the wild extras on offer can make it well worth hitting. 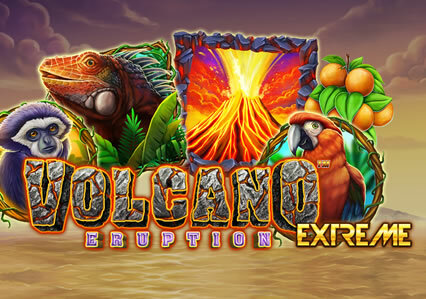 If those wilds work their magic, then Volcano Eruption Extreme can certainly live up to its name. 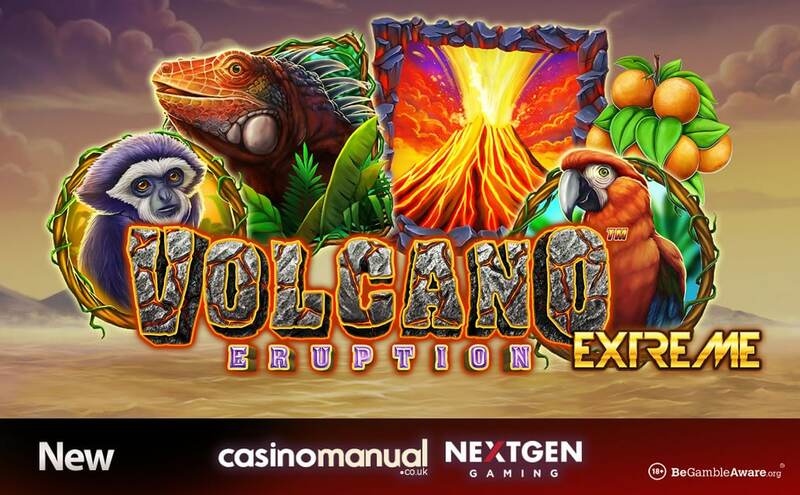 You can play Volcano Eruption Extreme at LeoVegas Casino – with nearly 1,250 video slots, there’s plenty of new releases like Blueprint Gaming’s Valletta MegaWays, Play ‘N Go’s Contact and WMS’ Spartacus Legendary Warrior. You also have Blueprint Gaming’s Gun Slinger Fully Loaded exclusively. Register now to get 20 no deposit free spins on Play ‘N Go’s Rich Wilde and the Book of Dead. On your first deposit, you will get a 100% bonus up to £100 plus 20 more bonus spins. In fact, you’ll get the same offer on each of your first 4 deposits – this can add up to £400 in bonuses and 100 bonus spins in total.